The history between Valka and her loyal Stormcutter, Cloudjumper, is long and full of friendship, adventure and danger. The two first met when the relationship between Vikings and dragons was as unstable as a ship full of Berserkers. Back then, Valka stood alone as the only advocate for peace between the two species. However, during a particularly vicious battle between Vikings and dragons, Valka was horrified to find the massive, four-winged Stormcutter staring at her infant son. It was at this moment that Valka realized that what she had always known deep down about dragons was actually true: Dragons were not vicious creatures at all, but were instead curious beings who had been misunderstood for centuries. The Stormcutter did not intend to hurt Hiccup, but was instead curious about the tiny human. Valka and Cloudjumper locked eyes and formed an instant bond. This connection caused Cloudjumper to react negatively when Stoick burst in and assumed that the dragon was attempting to attack his family. He tried to attack the Stormcutter with an axe, but believing that Stoick was attempting to hurt its new friend, the dragon took to the air with Valka in a desperate attempt to protect her. While the Vikings of Berk believed that Valka had been kidnapped and killed, she was actually taken to the Dragon Sanctuary. 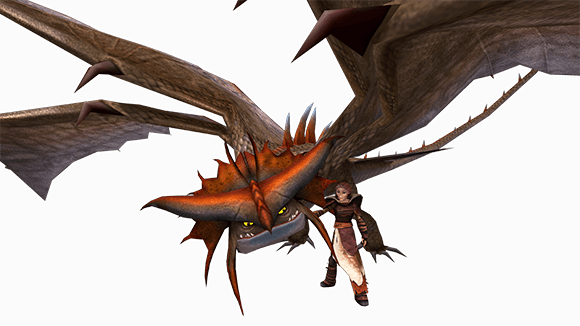 Confident that the dragon would not harm her, Valka named it Cloudjumper. From then on, the two were inseparable. They then began rescuing other dragons from dragon hunters. Valka and Cloudjumper have overcome all sorts of challenges together - dragon hunters, Drago and his Bewilderbeast, and awkward family reunions, just to name a few! Their bond is one of the strongest among all Viking-dragon partnerships on Berk, solidly based on an unbreakable friendship. As a student of the School of Dragons, we encourage you to take advantage of their expertise and seek out their wisdom and advice. 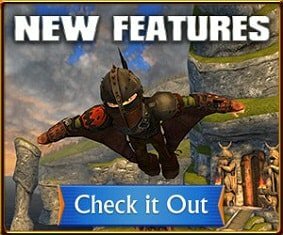 Valka and Cloudjumper are always ready to guide you in the right direction on a quest or to fly into battle beside you to defend Berk against invaders like Harald and Stormheart. The two are rarely seen apart from one another, and can most often be found outside the Great Hall in Berk or in the Hatchery in the School of Dragons. We did not know the name of our buyer, only that he demanded one Hideous Zippleback and was willing to pay us enough gold to make even the gods envy us. We did not know why he wanted this specific dragon breed, nor what he intended to do with it, but the promise of riches kept us from asking too many questions. How could we refuse such an offer? It turns out that capturing the Hideous Zippleback was the easiest part of this job. We had scarcely caged the subdued dragon when we saw a Stormcutter flying over our ship. At first, we aimed our net launcher at it, thinking that we could become even richer with a captured Stormcutter. Then, as it arced downwards, we saw someone riding on the dragon’s back. The gender of the dragon rider was indistinguishable, for they were covered from head to toe. The rider was wearing a blue mask that hid their face, and there were large spikes protruding from the top. It carried heavy armor, which resembled that of another dragon. The gloves even had false claws that looked like a dragon. The dragon rider carried a shield painted blue, red and yellow and a staff that had a wicked curve on either end. “What in Odin’s name is that?” one of my crew members asked. I opened my mouth to answer, but closed it immediately for I didn’t have a clue. The rider and the Stormcutter swooped lower, testing our defenses. They seemed to move together as one. It was as if they were one single being. The rider still said nothing, but I could see that whatever I had said had angered the both of them. They dove down, and before we could even grab our axes, the Stormcutter had snatched the cage and was carrying away the Hideous Zippleback, and with it, our fortunes. “Hey!” I cried out stupidly, but they were already making their way towards the horizon. They were long gone, and in only a matter of seconds. I know not who this mysterious dragon rider and Stormcutter are, or why they stole the Hideous Zippleback we had fairly captured. I do know that these two now pose a threat to all us dragon hunters and traders.